CHICAGO (AP) -A quick start against another struggling team proved to be the perfect remedy for the slumping Chicago Blackhawks. Robert Lang and Patrick Sharp each scored two goals, and the Blackhawks defeated Nashville 5-2 Wednesday night, handing the Predators their fifth straight loss. Lang and Sharp each connected once in the first period, as Chicago scored on three of its first four shots to take a 3-0 lead 10:01 in. "When you get off to a start like that, it's easier," Lang said. "It puts them on their heels. It's nice to have a game when you're in charge, in control the whole time. Dustin Byfuglien also scored for the Blackhawks, who ended a two-game losing streak and won for only the second time in their last eight. Martin Havlat had three assists. "Everybody played well, every line did something," Lang said. "The guys who are supposed to score scored and everybody else did their jobs. It was pretty much perfect." Sharp's first goal was his league-leading sixth short-handed. The Blackhawks lead all NHL teams with 11 short-handed scores. "It's just attacking, being aggressive," Sharp said of his short-handed success. "If we're passive, standing around, that allows their skill players to deal the puck and make plays. "We knew it was a big game for us. We learned a lesson there: That losses can pile up quickly. I thought we played three sound periods of hockey." 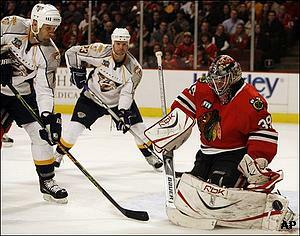 Nikolai Khabibulin made 19 saves for Chicago. J.P Dumont and Radek Bonk had power-play goals for the Predators, who have lost seven of their last eight. "It has been a rough go," Nashville's Jason Arnott said. "We've got to start showing more accountability to each other. We've got to get back to basics." Nashville starting goalie Chris Mason was pulled early in first period after allowing goals on the first two shots he faced. He was replaced by Dan Ellis, who stopped 25 of 28 shots. "I wanted to get everyone's attention," Nashville coach Barry Trotz said of the quick goalie switch. "With it being 2-0 that early in the game, it didn't want to see it get out of hand. "Our coverage just wasn't there and we didn't even let our goaltender get his feet on the ground." The Predators have scored just seven goals during their five-game slide and 14 in their last eight contests. "We haven't been scoring a lot of goals, so we haven't had a lot of margin for error," Trotz said. Lang opened the scoring 3:02 in. Left wide open in the lower right circle, he beat Mason after taking Havlat's centering pass from behind the net. Byfuglien made it 2-0 at 5:23 on the Blackhawks' second shot. After quickly circling the net, Byfuglien fired from the left edge of the crease. His shot deflected in off Mason's stick as Mason dove across the goalmouth. Ellis replaced Mason after the goal. Sharp's short-handed goal at 10:01 made it 3-0. Set up by Jonathan Toews' drop pass, Sharp ripped a shot from the left circle that sailed over Ellis' glove. Lang's second goal, also from the right circle and set up by Havlat, gave Chicago a 4-0 lead at 3:15 of the second. Power-play goals by Dumont and Bonk, scored 1:11 apart, pulled Nashville to 4-2. Dumont backhanded in a rebound of Jason Arnott's shot from the point at 4:27 to get Nashville on the board. At 5:38, Bonk, in front of the net, deflected in Shea Weber's drive from high in the slot. That was as close as the Predators got. Sharp's second goal, on a power play with 1:05 left in the second, made it 5-2. He fired in a loose puck from the left edge of the crease. Notes: After the game, Blackhawks coach Denis Savard announced the team had recalled D Cam Barker from Rockford of the AHL and planned to reassign D Magnus Johannson, who must first clear waivers. ... LW Ben Eager, acquired by Chicago from Philadelphia on Tuesday for D Jim Vandermeer, played is first game for the Blackhawks and had an assist on Byfuglien's goal. ... Chicago rookie C Petri Kontiola earned his first NHL point with an assist. .... The Blackhawks named two of their legendary former players - Bobby Hull and Stan Mikita - as "official ambassadors" on Wednesday. The Hall-of-Famers are two of only four players whose numbers have been retired by the team Mikita is the Blackhkawks' all-time leader in games (1,394) and points (1,467). Hull is the team's all-time goal-scoring leader (604). ... Nashville LW Steve Sullivan remains out indefinitely with a back injury.